Per Mosseby of Pixbox says at Hubbub 07 he thinks the developing countries is where the mobile revolution will truly happen. When mobile applications have been developed, the laptop is better than the cellphone in all aspects of the services that were going mobile. That is however changing, Per Mosseby says. – Things are really starting to happen. 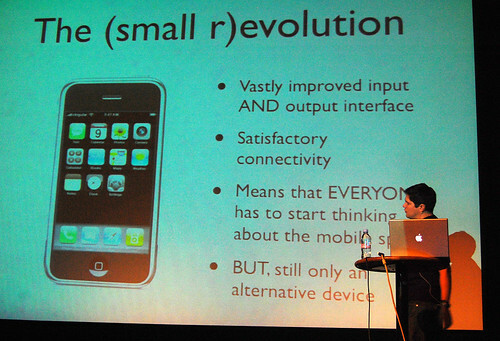 The iPhone is a small revolution in this field. This means that everyone has to think about mobility. – In my eyes it all comes back to what I think is going to be the big revolution in the mobile space. When the bottom of the pyramid population can afford cellphones – all these 4 billion people who don’t have a digital identity – there’s going to be a lot of turnover. – They do not have an alternative device to go back to. 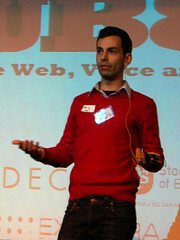 David Haddad of Spontu works with social networking on the mobile. Since Hubbub is all about convergence, he focuses on the convergence of positioning, connectivity and powerful mobiles. Be intellectually honest about your motivation. Solve a real human social inefficiency. Choose a technology that works, with an eye on the future. Don’t compete, but rather build on other players. There’s a good basis available to build upon. Build something that’s good enough today. It needs to solve a real problem. Social networking needs to be all-inclusive, and work for everyone. Follow the least common denominator approach when finding your target audience. – Execute a killer product strategy, don’t plan a killer app, David Haddad says. He then answers three questions. How will the mobile look like in the future, i e in four years? 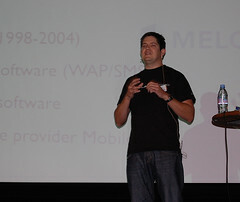 – The Nokia N95 is targeted for the early adopters. Down in four years time, the phone that’s going to be in everyone’s hands is going to be similar to what you have now. The N95 is a good indicator. How will social networking look in the future? – If everyone in this room has an N95, how will that affect my experience with for instance Facebook? There are three things that differ from our current experience. – The social networking will become concurrent, cirkumstantial and fundamentally socially impactful. David Haddad thinks the adding of friends on social network sites will be automatic, by for instance bluetooth. News feeds will be more realtime. What can we do today to change the social networking environment? Choose your method of connectivity. How do you want to position users? There are many different technologies. How will you make money? Find a business model. He believes in combined solutions for web and mobile units. In the q&a a few interesting issues, including privacy and more on killer product strategies came up, but unfortunately there were network problems… and I didn’t catch much. I’m sure others have more, though. Per Mosseby, CEO of Pixbox, will speak about ”why the preferred mobile Internet device among the wealthy will continue to be the laptop computer, and why the smaller-than-subnotebook-revolution is happening – in developing countries”. 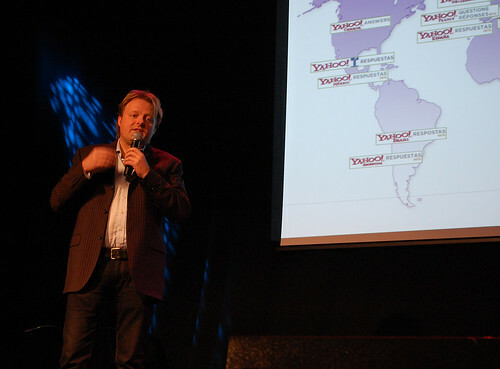 Stefan Waldeck, Yahoo, talks about mobile marketing and search marketing at Daytona Sessions. Self expression, social networks, and new technologies are the new trends. In the cellphone all of this comes together, he says. – The cellphone is with you 100% of your waking hours. Plus it has a higher penetration than computers. When you move from 2G to 3G you start using photo and video a lot more. Yahoo!Go is a small java applet which lets the user access email, flickr, search and more. It will be in 200 cellphone models at the end of the year. – It is very easy to use on a small screen. There’s also an RSS reader integrated. – We haven’t tried to copy what we do on the internet, but do a special solution for the cellphone. Mobile seach is based on need and boredom, which translates into people wanting usefull information and games. Search ads on mobile phones are more sensitive to appearing in the top part of the screen, since people don’t scroll much. But click through rates are much higher than on the web.